Operation ‘Weserübung’ (Weser exercise) was the German conquest of Denmark and Norway between 9 April and 10 June 1940). The German forces invaded Denmark and Norway, ostensibly as a pre-emptive move against a planned and, indeed, openly discussed Franco-British occupation of both these countries, and on arriving in Denmark and Norway German representatives told the relevant governments that the German forces had entered their countries only to ‘protect [their] neutrality’ against the threat of Franco-British aggression. Although the whole of ‘Weserübung’ was planned as a single operation, it is worth noting that the two target nations’ major differences in geography, location and climate made the several components of the German operation very dissimilar in size and duration. From the spring of 1939, the British Admiralty had come to regard Scandinavia and the Baltic Sea as a potential theatre of war in any conflict with Germany, and such a conflict was now seen as all but inevitable. The British government was extremely reluctant to engage in another land conflict on the continent of Europe, the consensus being that any such war would be essentially a repeat of World War I’s Western Front with its strategic stalemate and huge casualty lists. Thus the British started to consider a blockade strategy which would materially weaken the German forces and the war-making industries on which they relied. At this time German heavy industry was heavily dependent on the import of iron ore from the northern Swedish mining district, centred on Kiruna and Malmberget. While some of this ore was shipped from the Swedish port of Luleå , some 90% of it was transported by rail from Sweden to Norway, where it was loaded on ships in Narvik. The British therefore came to believe that interdiction of Norway’s coast could cut the flow of iron ore to Germany, and also serve to tighten a general naval blockade of Germany by preventing any of its shipping from using Norwegian coastal waters. In October 1939 the head of the German navy, Grossadmiral Erich Raeder, discussed with Adolf Hitler the danger he perceived as being posed eventually by the establishment of British bases in Norway, and thus the desirability of Germany seizing these bases before the British tried to do so. Raeder further argued that German possession of Norway would give the German navy control of the nearby seas, and provide Germany with advanced bases for future operations against the UK. The other branches of the German armed forces showed no interest in Scandinavia at this time, however, and Hitler had just issued the Führerweisung Nr 6 of 9 October 1939, stating that the main effort would be a land offensive against France via the Low Countries. Toward the end of November, Winston Churchill, the new First Lord of the Admiralty, proposed the mining of Norwegian coastal waters. This would force ore transport vessels to travel through the open waters of the North Sea, where the Royal Navy could more easily and more consistently intercept and destroy or capture them. This proposal was rejected by the current prime minister and foreign secretary, Neville Chamberlain and Lord Halifax, on the grounds that it might cause an adverse reaction among neutrals such as the USA. After the start of the Soviet-Finnish ‘Winter War’ in November 1939, the diplomatic situation was much changed and Churchill therefore once again proposed his mining scheme, but was again refused. In December, the UK and France began to lay serious plans for the delivery of matériel as well as manpower aid to Finland on the grounds that this latter was fighting a country which was, at the time, a German ally. The Allied plan called for a force to be landed at Narvik in northern Norway, and then to advance across Sweden into Finland. This plan would also open the way for Allied forces to occupy the Swedish iron ore mining region. The plan now received the support of Chamberlain and Halifax, who were counting on Norwegian co-operation. Both Norway and Sweden let it be known that no Anglo-French involvement in Scandinavian affairs would be tolerated, however. Planning for the expedition nonetheless continued, but the justification for it was removed when Finland sued for an armistice with the USSR in March 1940. Now firmly convinced of the threat posed by the Allies to the iron ore supply on which Germany was so reliant, Hitler on 14 December 1939 ordered the Oberkommando der Wehrmacht to begin preliminary planning for an invasion of Norway. The preliminary plan was named ‘Studie Nord’ (Study North) and called for the use of only one German army division. In the period 14/19 January the German navy developed an expanded version of this plan, and concluded that two factors were essential. The first was the use of operational as well as tactical surprise to reduce the threat of Norwegian resistance and British intervention, and the second the use of German warships rather than comparatively slow merchant ships to transport the invasion forces and thus permit the simultaneous descent on all of the invasion targets. This new plan called for the army to provide a full corps of one mountain division, two infantry divisions and one motorised infantry brigade; the Luftwaffe was to contribute one airborne division. The target objectives of this force were Oslo (the Norwegian capital and primary population centre), Bergen, Finnmark, Narvik, Stavanger, Tromsø and Trondheim. The plan also called for the swift capture of the King Christian X of Denmark and King Haakon VII of Norway in the hopes that this would trigger a rapid surrender. On 21 February 1940, command of the operation’s land element was entrusted to General Nikolaus von Falkenhorst, an Arctic warfare specialist, despite Hitler’s desire for a unified command. The final plan was ‘Weserübung’ completed on 27 January 1940. It would be under the command of Falkenhorst’s own XXI Corps (redesignated as Gruppe XXI on 1 March 1940) and was to include Generalmajor (from 1 April Generalleutnant) Eduard Dietl’s 3rd Gebirgsdivision and five infantry divisions, none of the latter having yet been tested in battle. The initial echelon would consist of three divisions for the assault, with the other three to follow in the next wave, and three companies of paratroopers would be used to seize the airfields which were an essential element of the operation. The decision to add Generalleutnant Valentin Feurstein’s 2nd Gebirgsdivision was made at a later stage. In its first form the plan was based on an invasion of Norway, which was the primary objective, with control of Denmark’s airfields gained by diplomatic means. However, Hitler issued a new directive, Führerweisung Nr 10a, on 1 March, and this mandated the invasion of Denmark as well as Norway. This change was a reflection of the Luftwaffe’s insistence on the need for secure fighter bases and sites for air warning stations in Denmark. Generalleutnant Leonhard Kaupisch’s Höheres Kommando zbV XXXI was formed for the invasion of Denmark, this formation comprising Generalleutnant Walter Wittke’s 170th Division, Generalleutnant Otto Röttig’s 198th Division and Oberst Günther Angern’s 11th Schützenbrigade (mot.). The entire operation would be supported by Generaloberst Erhard Milch’s Luftflotte V in the form of Generalleutnant Hans Geisler’s X Fliegerkorps, which fielded 290 level bombers, 40 dive-bombers, 100 twin- and single-engined fighters, 70 reconnaissance aircraft and, perhaps most important of all, some 500 Junkers Ju 52/3m transport aircraft for supply and the delivery of the small airborne forces involved in the operation. The navy contributed virtually all of its surface fleet, and these warships were supplemented by some 41 troop, weapon and fuel transports. The situation began to come to a head in February 1940, when the British destroyer Cossack halted and boarded the German transport ship Altmark in Norwegian waters as the latter sought to return to Germany after serving as a support vessel for the raiding cruise of the pocket battleship Admiral Graf Spee. This action violated Norwegian neutrality but freed 300 captive British sailors, themselves held in violation of Norwegian neutrality and international law, which demanded that all prisoners of war be released as soon as their captors’ vessel entered neutral waters. Hitler saw this as irrefutable proof of the UK’s total willingness to violate Norwegian neutrality, and so became even more strongly committed to the invasion plan. On 12 March, just as the ‘Winter War’ was coming to its end, the British finally decided to send an expeditionary force to Norway. The expeditionary force began boarding on 13 March, but was recalled and the operation cancelled with the end of the ‘Winter War’ on this day. Instead the British cabinet voted to proceed with the ‘Wilfred’ mining of Norwegian coastal waters, followed by troop landings. The first ‘Weserübung’ ships left Germany on 3 April, and on 8 April a British destroyer began laying the first mines in Norwegian waters. On 9 April the German invasion started. In overall strategic terms, Denmark was relatively unimportant to Germany, and was needed only as a staging area for the ‘Weserübung’ operations in Norway. Small and relatively flat, Denmark is ideal terrain for the type of fast-moving operations which the Germans liked, and Denmark’s small army, centred on Major General Hans Aage Rolsted’s 1st ‘Seeland’ Division based in Copenhagen and eastern Denmark, and Major General Frederick Christian Essemann’s 2nd ‘Jutland’ Division based in the Jutland peninsula, had little hope of success in armed resistance to ‘Weserübung’. Nevertheless, in the early morning hours some Danish regiments engaged the German army, suffering a few dozen dead. After 1,000 German infantry landed in the harbour of Copenhagen, the Danish capital, a detachment of troops from the Royal Life Guard Regiment engaged them. Just as the first few shots where being fired, several formations of Heinkel He 111 and Dornier Do 17 bombers roared over the city. Faced with the explicit threat of Luftwaffe bombing of the civilian population, King Christian X capitulated almost instantly in exchange for retaining political independence in domestic matters. This left the Germans free to concentrate their efforts on the invasion of Norway, which Germany wanted not just to safeguard continued iron ore shipments from Sweden via Narvik, but also for its suitability as a base for naval units, including U-boats, from which to harry Allied shipping in the North Atlantic: the long northern coast was an excellent place from which to launch U-boat operations into the North Atlantic in order to attack British commerce. The invasion of Norway was entrusted to Gruppe XXI, whose main formations were Generalleutnant Hermann Tittel’s 69th Division, Generalleutnant Erwin Engelbrecht’s 163rd Division, Generalleutnant Kurt Woytasch’s 181st Division, Generalleutnant Richard Pellengahr’s 196th Division and Generalleutnant Max Horn’s 214th Division, as well as two regiments of the 3rd Gebirgsdivision. It had been clear right from the start that the best way to undertake the northern part of ‘Weserübung’ was to take key points round Norway’s long coastline with sea-landed forces, supported in key areas by airborne troops who would land to secure airfields and the like, and then rush in reinforcements to deal with Norwegian opposition before it could be rallied under effective leadership. The primary threat was the Royal Navy, whose overwhelming matériel superiority over the German navy threatened the destruction of the assault forces even before they reached Norway. The invasion of Norway was based on five primary groups, each tasked with the capture of a specific port through which reinforcements could be poured, and within this overall concept ‘Weserübung’ was divided into the three-part ‘Weserübung Süd’ to take Oslo, Kristiansand and Bergen in the ‘Oldenburg’, ‘Karlshafen’ and ‘Bremen’ sub-operations, and the two-part ‘Weserübung Nord’ to take Trondheim and Narvik in the ‘Wildente’ and ‘Naumburg’ sub-operations. In ‘Weserübung Nord’, the battle-cruisers Scharnhorst and Gneisenau provided distant cover for Gruppe I (destroyers Georg Thiele, Wilhelm Heidkamp, Hans Lüdemann, Hermann Künne, Diether von Roeder, Anton Schmitt, Wolfgang Zenker, Bernd von Arnim, Erich Giese and Erich Koellner) delivering 2,000 men of the 139th Gebirgsjägerregiment under Dietl to Narvik, and Gruppe II (heavy cruiser Admiral Hipper and destroyers Paul Jacobi, Bruno Heinemann, Theodor Riedel and Friedrich Eckoldt) conveying 1,700 men of the 138th Gebirgsjägerregiment to Trondheim. In ‘Weserübung Süd’, Gruppe III (light cruisers Köln and Königsberg, gunnery training ship Bremse, transport Karl Peters, three torpedo boats and five S-boote) carried 1,900 men of the 69th Division to Bergen; Gruppe IV (light cruiser Karlsruhe, three torpedo boats and seven S-boote) ferried 1,100 men of the 163rd Division’s 310th Regiment to Kristiansand; Gruppe V (heavy cruiser Blücher, pocket battleship Lützow, light cruiser Emden, three torpedo boats and eight minesweepers) transported 2,000 men of the 163rd Division to Oslo; and four minesweepers moved 150 troops to Egersund. Late in the evening of 8 April, Gruppe V was spotted by the Norwegian guard vessel Pol III, which was then destroyed. However, Blücher was sunk in the Oslofjord on the same day by ancient an 11-in (280-mm) gun installed at Oscarsborg fortress in May 1893, and by equally ancient torpedoes: during the early morning of 9 April, the gunners of the Oscarsborg fortress fired on Blücher, the leading German ship, which had been illuminated by searchlights at about 05.15. Within two hours the ship, unable to manoeuvre in the narrow fjord, had sunk and taken with her some 600 men. The Allies had been able to warn the two Scandinavian governments of the impending threat, but neither Denmark nor Norway had done anything to improve their defence postures, Denmark because she could do little and Norway because she was unwilling to be seen undertaking military preparations. The Germans had issued a surrender ultimatum to each country just before the start of operations, and Denmark’s capitulation allowed the Höheres Kommando zbV XXXI to complete its tasks without difficulty. Norway’s government rejected the German demands and the landings went ahead as planned as the Norwegian forces mobilised under the command of Colonel Otto Ruge, who was immediately promoted to general on his appointment to replace the unfit commander-in-chief. 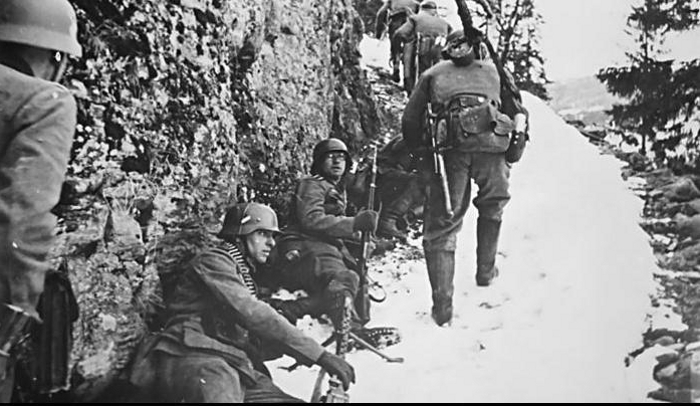 At Narvik the 3rd Gebirgsdivision force was faced by Major General Carl Gustav Fleischer’s 6th Division, but secured its objectives easily as the Norwegian formation was not mobilised and the city was surrendered by a Quisling. At Trondheim the opposition was found by Major General Jacob Ager Laurantzon’s 5th Division, but again the Germans secured their objectives without difficulty. Some resistance was offered at Bergen, for even before the Germans got ashore and into limited action against Major General William Steffens’s 4th Division, Königsberg was crippled by Norwegian shore batteries and later sunk by dive-bombers of the Fleet Air Arm operating from a British aircraft carrier. At Kristiansand and Arendal Major General Einar Liljedahl’s 3rd Division was soon in retreat before the German forces, whose landings had been upset by the torpedoing of Karlsruhe by the British submarine Truant: in this sector German airborne troops were used to support the amphibious landings, Stavanger and its airfield at Sola being taken by Major Erich Walter’s 1/1st Fallschirmjägerregiment in the world’s first paratroop operation. But at Oslo the Germans were nearly repulsed even before they got ashore to face Major General Carl Johan Erichsen’s 1st Division and Major General Jacob Hvinden Haug’s 2nd Division, for the assault force under Konteradmiral Oskar Kummetz was heavily shelled by the Norwegian coastal batteries, which sank Blücher, as noted above, while shore-launched torpedoes also severely damaged Lützow, which had to turn back to Germany. Even so, Engelbrecht managed to get part of his 163rd Division ashore and then to take half of Oslo and the arsenal at Horten. The German position was stabilised by the arrival at Fornebu airfield of airlifted reinforcements. The German threat to Norway was dangerous, but was scattered and could have been contained by rapid and concerted action on the part of the Allies. No such action was forthcoming, though the Home Fleet under Admiral Sir Charles Forbes tried its best. The battle-cruiser Renown was already in the area with four destroyers, escorting the minelaying forces for ‘Wilfred’, and Forbes immediately put to sea with the maximum number of vessels he could raise, in all two battleships, one battle-cruiser, four cruisers and 21 destroyers. But this response was ill considered, especially as the cruisers lying at Rosyth to embark troops for Narvik, Trondheim, Bergen and Stavanger were now ordered to offload the troops and sail in support of the Home Fleet, and as the elderly fleet carrier Furious was rushed to sea so rapidly she had no time to embark her fighter force. The British were more concerned with intercepting the German battle-cruisers Scharnhorst and Gneisenau, which were operating in ‘Juno’ as a detached squadron in the North Sea as a decoy for British naval countermeasures, and other German naval units than in delivering troops to Norway. Yet it was troops which were required to contain the scattered German effort. The Germans rushed in reinforcements and began to move out of the ports into the neighbouring countryside with the object of consolidating their position and linking up, and it was only in the period 14/19 April that the Allies finally began to land troops in Norway. The Allied effort was centred on the capture of Narvik and of Trondheim, but little could be achieved against the growing German strength. The Trondheim effort was abandoned on 2 May, and Narvik was evacuated on 8/9 June after the Allies had finally taken this vital city. As the Narvik force was evacuated the British fleet carrier Glorious encountered Scharnhorst and Gneisenau and was sunk, together with her two escorting destroyers, although Scharnhorst was badly damaged by a torpedo from one of the escorts, and Gneisenau was similarly damaged a few days later. Both ships were out of action for six months. The Germans were now in full control of Norway, and Ruge had little option but to surrender on 10 June. The Germans had lost 5,636 men killed and missing, while the losses of the Allies were 3,734 (1,869 British, 1,335 Norwegians and 530 of the combined Franco-Polish force). ‘Weserübung Nord’ did not include a military assault on neutral Sweden, and indeed there was no need for any such undertaking: by taking Norway, the Kattegat and Skagerrak separating Denmark and Norway, and most of the shores of the Baltic Sea, Germany had encircled Sweden from the north, west and south, and in the east lay the USSR, successor to the Russia which had for centuries been Sweden’s and Finland’s arch enemy, and was currently on friendly terms with Germany under the terms of the Molotov-Ribbentrop Pact of August 1939. Thus the maritime trade of Sweden and Finland was wholly controlled by the Germany navy, and as a result Germany was able to exert pressure on Sweden to permit the transit of military goods and soldiers on leave. On 18 June an agreement was reached for soldiers to travel unarmed and not as part of unit movements. During August 1940, Finland agreed to grant access to her territory for the German forces, initially for the transit of troops and military equipment to and from northernmost Norway, but soon also for the establishment along the transit road of the minor bases which would eventually grow in preparation for ‘Barbarossa’.